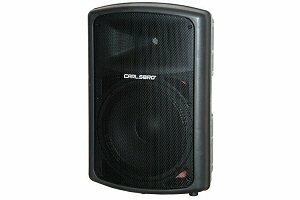 Ex Demo Carlsbro Gamma 10/250a active speaker. SOLD. These are boxed and only used to demo within the shop. Sold with 1 month warranty. XLR input and through. Low mid and hi controls on rear. Switchable between line and mic input. 300 watts rms. Was £259 now £219 per speaker ( £438 a pair ). Carlsbro has been a well known brand for many years but in 2009 went into liquidation. Only 1 pair available. Ex shop display. Boxed with power cable and manual.